What does the Driver Power State Failure Blue Screen error mean? 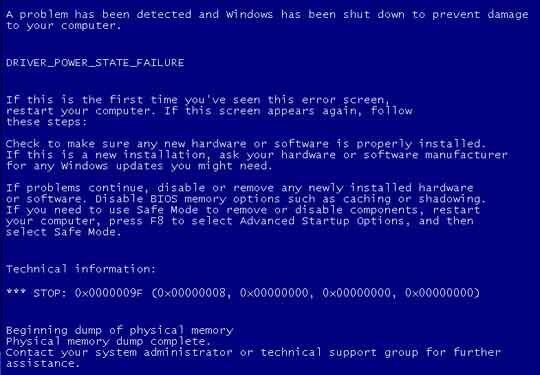 If you’ve arrived at this article, it’s because you’ve encountered a Blue Screen of Death — or, for short, BSoD. Despite the name, a BSoD doesn’t mean that your computer is broken beyond repair — it just means it encountered something that it didn’t know how to interpret. Sometimes you never encounter the problem again, but other times it persists, possibly even to the point where you can’t use your computer. Since you took the care to document your error, we’re likely dealing with the latter, so here we go. 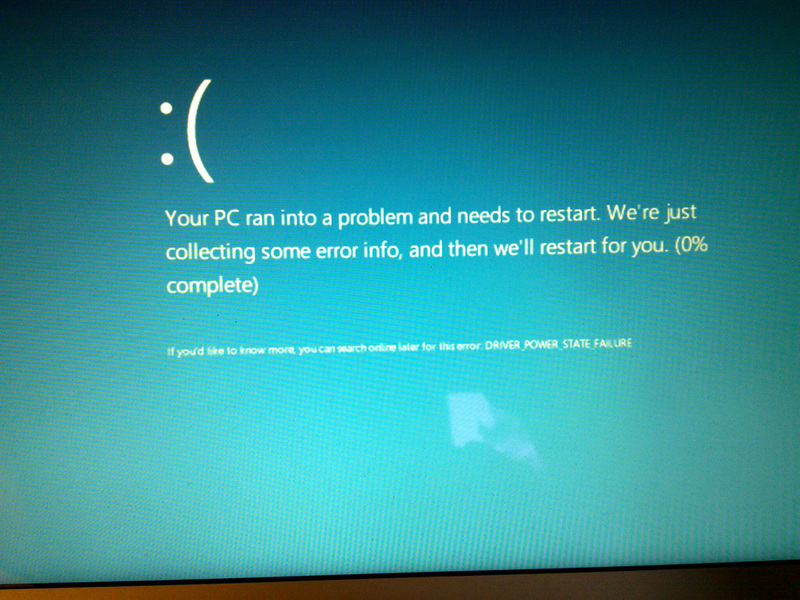 What your BSOD looked like on Pre-Windows 8 systems. What it resembles on Windows 8. This particular Blue Screen, DRIVER_POWER_STATE_FAILURE (also known as 0x0000009F), is (usually) encountered due to driver errors encountered when, say, you put your computer to sleep or take it out of sleep. Drivers are instructions given by your device to tell your computer how to interact with them — your keyboard’s driver is what registers the keys you tap as letters to appear on your screen. Drivers are for peripherals and nearly every part of your computer. The motherboard, however, has a BIOS, which is just as important to keep updated as your device drivers. How do I fix DRIVER_POWER_STATE_FAILURE? If on a laptop, find the name of your laptop and the appropriate BIOS update for it. If on a desktop, find your model or look at the packaging of your motherboard to determine where you can find the manufacturer’s website and upgrade your BIOS. If your BIOS is fully upgraded or updating it didn’t fix your problem, continue reading. For driver updates, you have three choices: use the Device Manager, found in the Control Panel in all versions of Windows, and individually update your drivers from there. You can also search online manually for your driver updates or use our Driver Reviver software to save yourself the trouble. If upgrading the BIOS and drivers still hasn’t resolved your problem, then there may very well be a problem with your operating system installation (especially if you’re using Windows 8) or the hardware itself. To fix these problems, consult Microsoft’s tech support, visit a local computer repair shop, or call your computer manufacturer to learn more information about possibly faulty hardware.